The Star Island Corporation is celebrating its 100th year of “creating an environment that frees all who come to renew spiritually, explore matters of consequence, and gain knowledge about the world as it might ideally be.” Perhaps it’s time you paid a visit to our special island. 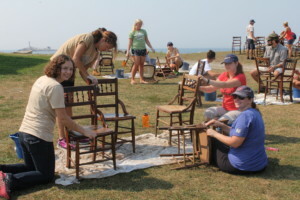 A group from Timberland participates in a workshop on staining and caning the dining room chairs during a company outing day trip. Afterward, the group enjoyed a picnic lunch they had brought to the island. 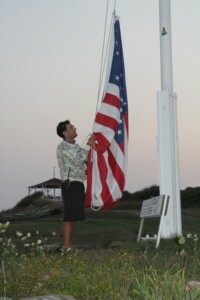 At sunset, in front of the Oceanic Hotel, Adam Shapiro lowered the flag at exactly 7:17 p.m. on September 1, 2015. Gosport is host to many of the lecture series and workshops provided during sponsored Star Island retreats and conferences. 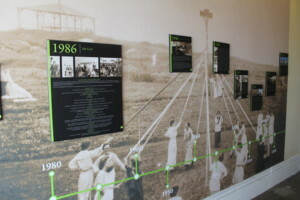 The walls of its main corridor tell the history and accomplishments of the organization over the past 10 decades. 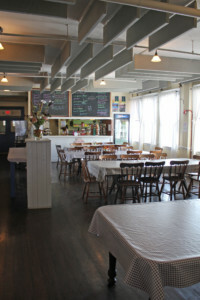 he snack bar inside the Oceanic Hotel is open throughout the day, serving both overnight guests as well as visitors. 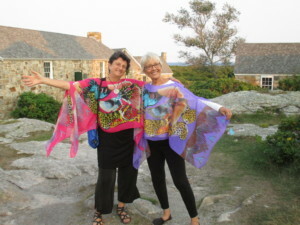 Nancy Cantor and Marcia Van Dyke model the new scarves available from the gift shop during an afternoon social hour in the Stone Village. There was probably no audible voice calling out to Capt. John Smith when he first landed here in 1614. It was a pragmatic vision that provided the lure. The Americas were literally a new world to the teams of explorers and exploiters from the old one. An island perch, close to the mainland but relatively safe and secure from any unfriendly natives, was perfect for fishing and getting bearings. One of the most photographed buildings on the island ­— Gosport Chapel, built in 1800. Indeed, fishermen were taking advantage of this “perch” long before Capt. Smith arrived, but it was he who mapped the Isles of Shoals, naming them “Smyth’s Isles.” He’s also said to have first dubbed this region of the continent New England, identifying it as his home away from home. The spot became the busiest commercial port on this side of the ocean, dominating the fish market and even setting prices for salt cod (a necessary staple of Catholic Europe) for more than a century. Even the name “Isles of Shoals,” is likely derived from the term for the “shoaling” or schooling of fish. Today, the Isles still offer both a mystical allure and a practical mission, but there is a new visionary appeal to Star Island taking shape in the 21st century. This rugged outpost that has invited and sustained a community of hardy denizens for centuries may now serve as a tutorial for the future of life and civilization on our crowded planet. Call it a microcosm of community and sustainability. After all, island life in the cold North Atlantic is rugged and sometime even hostile. A place of extremes removed from the comforts of the mainland is an excellent laboratory for basic survival and a place to test concepts in an actual community of residents. And the locals are on board. When Island Manager Jack Farrell is asked to describe his Star Island community, his answer is succinct but dense with pride: “Innovative, responsible, forward-thinking, capable. Technically speaking, Star Island is located within the borders of the town of Rye. It is the second largest of the group of nine rocky islands lying nearly 10 miles southeast of the mouth of the Piscataqua River. Five of the islands — Appledore (the largest of the Isles), Cedar, Duck, Malaga and Smuttynose ­— lie within the boundaries of Maine, while four of the islands — Lunging, Seavey, Star and White — belong to the Granite State. Today, for most visitors, these “spits of land” are not a point of access to America, they are avenues of escape. Seeking beauty, history and mystery (ghosts seem to dwell everywhere), people have traveled to these islands by everything from rowboat to sea kayak (and even by swimming — but don’t try this without putting in a few years of training). Still, the best way to get to the island is to ride in style on one of the large boats that make regular runs with passengers and supplies. Once on Star Island, foot power is the preferred method of transportation. Forty-three acres are there to enjoy and explore. Comfortable footwear is recommended. But don’t let this laconic image fool you — some people come to Star to relax, but for most it’s still a staging area for major exploration of new or unknown worlds. Sometimes they are exploring the world and environment around them, through lessons and seminars. There are more than 60 programs offered in topics ranging from history and religion to art and nature. Sometimes they come to explore the nature within, through meditation and introspection. And sometimes they are exploring the future. Consider, for example, the Green Gosport Initiative. Named for the “lost” town of Gosport on the north end of Star Island, the initiative is a community endeavor that combines innovative environmental projects and practices that have put Star Island at the forefront of sustainability for the region. Sunrise on Star Island. Sailors named the island for its points stretching in all directions — like the flashes of a distant star. Reducing the amount of goods that need to be shipped to or transported off the island is a goal of the initiative, and a major milestone was the unveiling of the new 420-panel solar array, the largest of its kind in New England. Discreetly located in the shadows of the Tucke Monument, the newly installed solar array provides up to 60 percent of Star’s energy needs throughout the summer season and 100 percent during the remainder of the year. “We shut down the generator in October and it doesn’t run again until May,” says Farrell. Of course, the island population dwindles to one during most of the winter months. Photographer Alexandra De Steiguer has been the official winter caretaker for 18 years. Her stark portraits of solitary life might be glimpses into the soul of the place. Each new year as the island reopens islanders rededicate to their mission with renewed zeal, composting and gardening and “thinking of waste as a resource that hasn’t found a home yet.” Recent conservation efforts have cut diesel consumption from 20,000 gallons to 5,800 per year. The island also uses an innovative, first-in-NH, rainwater filtration system that, along with an energy-intensive reverse osmosis system, keeps everyone hydrated. 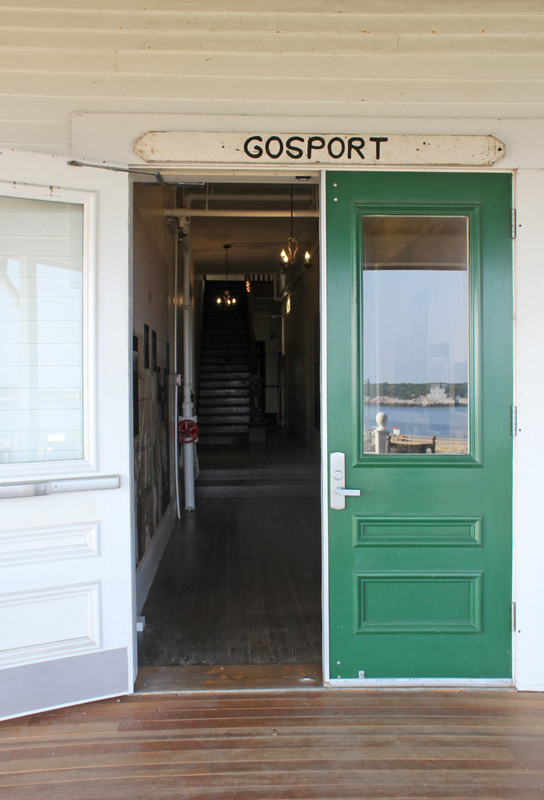 A critical component of the Green Gosport Initiative is education in hopes that sharing the lessons learned in this island “microcosm” might guide the larger world to a more sustainable future. On an individual level, behind-the-scenes tours allow visitors to see and experience sustainability efforts firsthand and perhaps adopt such future-friendly practices in their own lives. Sometimes the future is a thing of the past. New Hampshire’s Land and Community Heritage Investment Program (LCHIP) recently awarded a $100,000 grant to Star Island’s Oceanic Hotel. More than 100 years old, the Oceanic Hotel is the last of New Hampshire’s grand hotels to have never undergone a major renovation. It’s a time capsule for architects and students of the Victorian era and its main lobby, writing room, Pink Parlor and dining hall provide glimpses into the life of the late 1800s when Star Island attracted such notable artists and writers as Childe Hassam and Nathaniel Hawthorne. Ride aboard the Steamship Company’s M/V Thomas Laighton (named for poet Celia Thaxter’s father). Uncle Oscar can get you there. This cruise boat has a 20-passenger maximum. Reservations are suggested. Some say the hotel is haunted, but other say the entire island is overrun with ghosts. For those hoping to explore the realm of restless spirits, the Oceanic is a mecca. The fact that there are no locks on the hotel doors shouldn’t discourage you. Ghosts are not usually inhibited by such material barriers anyway. Perhaps the most tangible spirits of the past on Star Island live on in works of art. Poet Celia Thaxter lived for a very short time on Star. She spent much of her childhood at the nearby White Island lighthouse, then on Smuttynose Island and finally on Appledore at her family’s hotel. More can be learned at Vaughn-Thaxter Memorial Cottage, which houses a small museum and library for visitors to explore. From the cottage you can see the towering Tucke Monument and the John Smith monument on the southerly tip of the island. Thaxter and other writers found the remoteness and austerity of island life to be conducive to their creative efforts. So, even in realms of art and literature, Star Island is a point of embarkation to a larger world and a place to seek out one’s muse. Technology has changed the definition of remoteness, but the goal for many people to come to Star Island is simply to disconnect from the modern-day “normal” of a hectic pace and a need to constantly be connected to our technology devices. 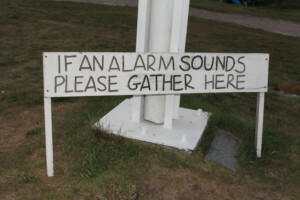 By tuning out the contemporary static, they find they tune in to a more serene signal where nature and the mind produce a unique and personal harmony. What’s next on the horizon? Star plans to build a new wastewater system that will also be another first-in-New-Hampshire. Treated wastewater will be recycled for such needs as toilet flushing, laundry and lawn irrigation. The sea water that’s currently used for toilets is corrosive and inhabited with oceanic microorganisms. Farrell notes that some regular guests may miss one aspect of this: phosphorescent algae in the toilet bowl sometimes added a magical touch to an overnight stay. Reverse osmosis is the process of creating drinking water from salt water. Simard explains that this unit (left) can process 25 gallons of brine a minute to get 5 gallons of fresh water. That’s 300 gallons per hour – pretty impressive. Maybe these descriptions are not so contradictory. After all, it’s still a pretty motley assortment of people with a wide range of backgrounds and motives who journey to Star Island, but it’s a spirit of industry and decency that holds things together on a rocky island in the midst of the fickle sea. Kyle Belmont, program and outreach coordinator, calls the island “a camp for all ages.” For day-trippers, there are short-term pleasures that they might seek out, such as the opportunity to explore the island and the historic lobby of the Oceanic Hotel, visit the snack bar or just browse in the bookstore and gift shop. Visitors can choose to partake in a weekend or week-long special interest retreat with overnight stays — or to just come for several hours, bring a picnic lunch or choose to have lunch in the dining hall (meal reservations are required for day-trippers). Just as the island is a laboratory for science, faith or mindfulness, it’s an inviting space for you to create your own Star experience. Personal retreats/conferences include yoga and meditation, birding, writing, watercolors, digital photography, along with community activities, educational lectures and workshops. 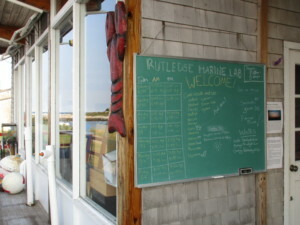 Snorkel gear, kayak and rowboat rentals are available for overnight guests. Star Island will be continuing the celebration of 100 years as a non-profit into the 2016 season. Registration for the upcoming season, which runs from mid-June through mid-September, opens on April 1.